When you are particularly interested in something, you develop a consciousness for it. Professor Peter Wiseman in his brilliant book ‘The Luck Factor’ writes at length about this phenomena, and how people who believe that they are lucky or unlucky see and do things that back up that conviction – spotting five-pound notes on the pavement, chance occurrences or meetings that turn out well, etc. In more down to earth terms, it’s like my dad said, funny how you don’t see many Ford Sierra’s on the road these days. But if you start looking for them you’ll spot them here and there. Derelict mills, or anything else for that matter, are no different. And so it was that I was driving back from visiting Ivy Bank Mill when out of the corner of my eye, I spotted something at the bottom of the steep valley below me. Slowing down, I caught a brief glimpse of what looked like a chimney, hidden in some trees. And then it was gone. I couldn’t pull over as the road was too narrow and there was traffic behind me. Making a mental note of where I was, I resolved to use the internet to help me find what I’d seen. Outside looking in. Look at the thickness of the walls – they don’t build ’em like this anymore. A combination of Google Earth and Geograph eventually led me to Griffe Mill. It looked somewhat ruinous, and there didn’t even appear to be a road to the place. Hmm. Only way to find out was to go for a look. Parking the car in Stanbury, a small hamlet clinging to the other side of the steep valley I’d frist spotted the mill, I found a side road that looked like it led to the mill. This turned into a farmtrack, and then into a footpath and then into a field, the further down the valley I got. How on earth wool and coal and people got down here every day beggars belief, it was hard enough in walking boots. I can only imagine there was a flatter track in from where the main road crossed the bottom of the valley, but it was no longer evident. Still, hiding amongst the thick summer foliage was a mill. But natures grip was such that any kind of exploring was hard, not just the dense undergrowth, but what sounded like most of West Yorkshire’s bees (or wasps) had nested inside, and very time I took a step in, the low buzzing noise increased in volume, like a world cup stadium full of vuvuzelas (remember them!?!?!). Not being a huge fan of multiple insect stings, I decided that a tactical retreat was necessary, so I took a few externals, and vowed to return when the weather was colder. Six months later, on a bitterly cold day, with sporadic snow showers pelting me with hard light snow, I once again made the descent down from Stanbury. Sure enough, the mill was much more visible, and whoever owned the field it sat in had thoughtfully done some major clearance work inside the mill, with freshly cut back trees and undergrowth giving me a clear path in. And no bees (or wasps). Inside – someone had done a spot of tree clearance which was nice. Now, we tend to think of industrial decay and dereliction as being a pretty new phenomena. Since the 1950’s British industry has been in a long slow decline, and with old Victorian properties often being more expensive to maintain and run than modern buildings, older stuff often falls into disrepair before being demolished or regenerated into something hip n’ trendy. But to find a textile mill that was closed in the 1920’s that is still standing is something rare. 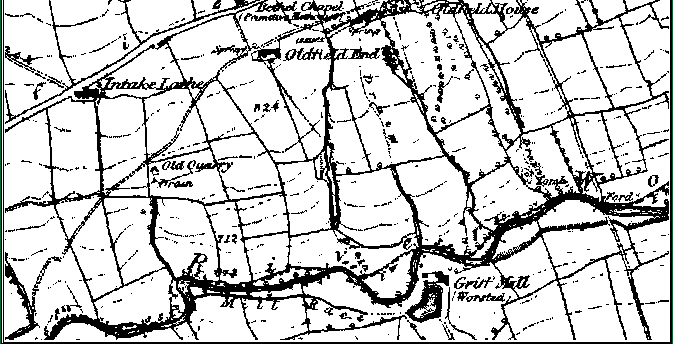 Given the location, it’s probably no surprise that the enterprise failed, in fact it’s more surprising it lasted as long as it did, as the 1862 Ordnance Survey map shows it (below). Maybe the coming of the railway to the nearby Worth Valley made the mill less competitive than the mills in that Valley now that they had ready access to the outside world for fuel and materials coming in, and finished goods going out. 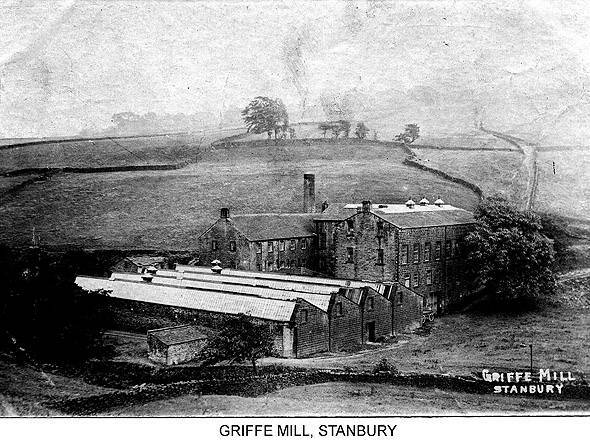 Griffe Mill, not even sat on a road, let alone a railway line must have become a liability. in 1928 the mill closed for good. Inside what was once a weaving shed, and later a shooting range. Big iron pipe from the mill lodge, presumably to feed a waterwheel or water turbine. See those houses on the right hand side (middle centre)? That’s where the road was that I was driving along when I saw this place peeping through the trees. Nice report, Andy. And interesting to compare the height of that tree. Where would we be without the internet, eh?